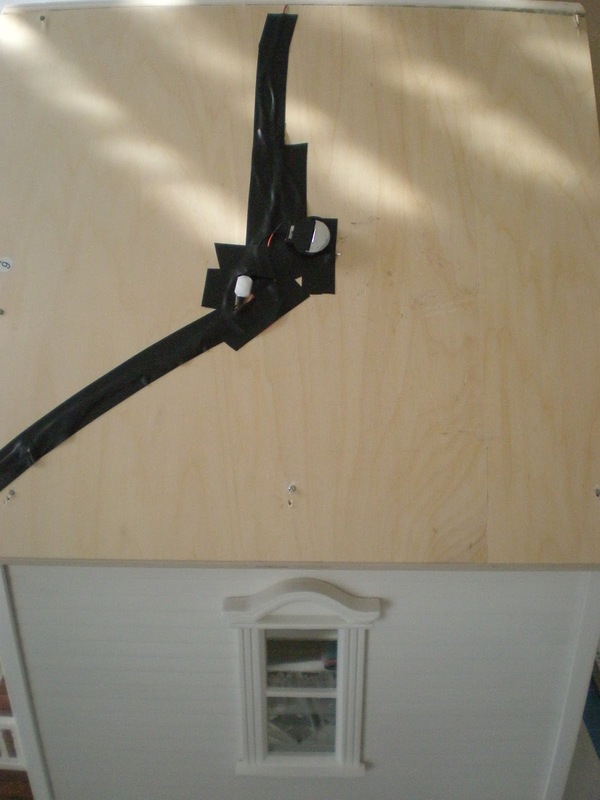 The wiring for this dollhouse arrived a couple of days ago. I've also been playing around with making accessories. I made the little island with left over bits of wood and the bead board on it is a tiny ridged cardboard. The towel bar and scroll that support the top are wire. I made a few towels too. 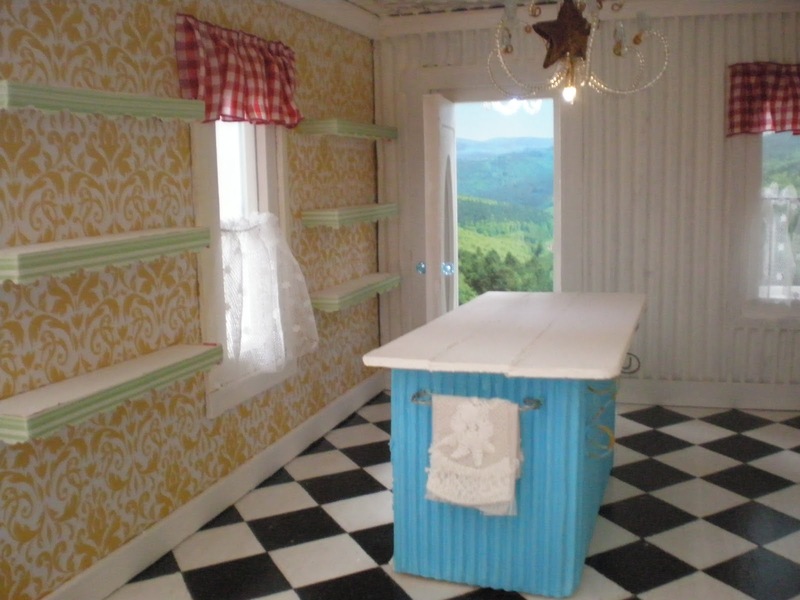 Behind the island is a whole wall of shelves. The chandelier is crystal seed beads and 2 rusty tin stars. 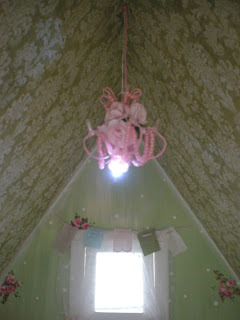 Upstairs I made a pink chandelier with pink roses. 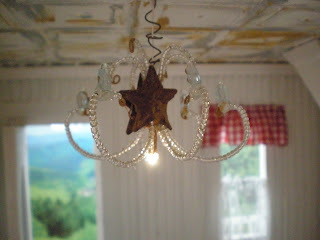 The front also has an old rusty chandelier. 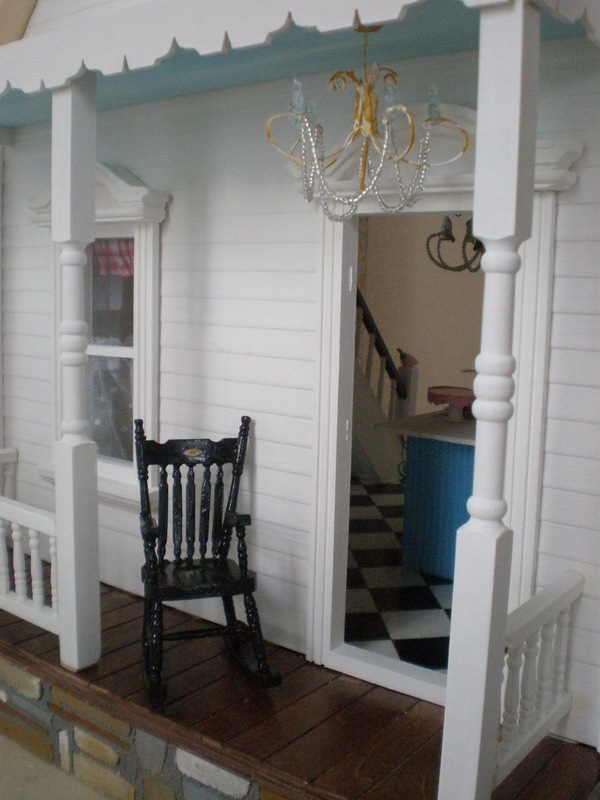 I painted a rocking chair black and sculpted some rocks on the concrete foundation. Here's all the wiring and switch. 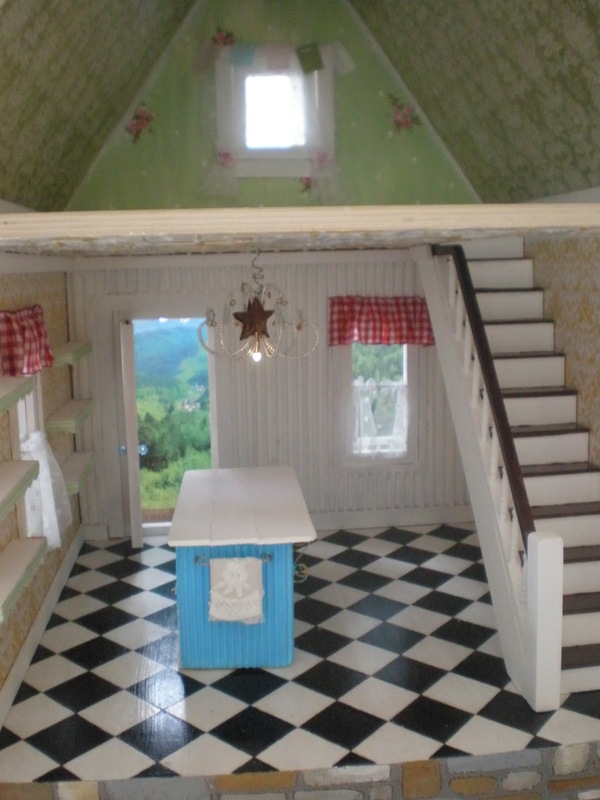 I think I'll hide in in a fake dormer or chimney. 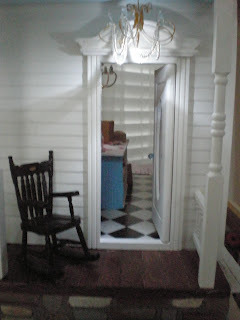 Now I'll need to finish the wood floor upstairs and shingle the roof. Thanks for dropping in! 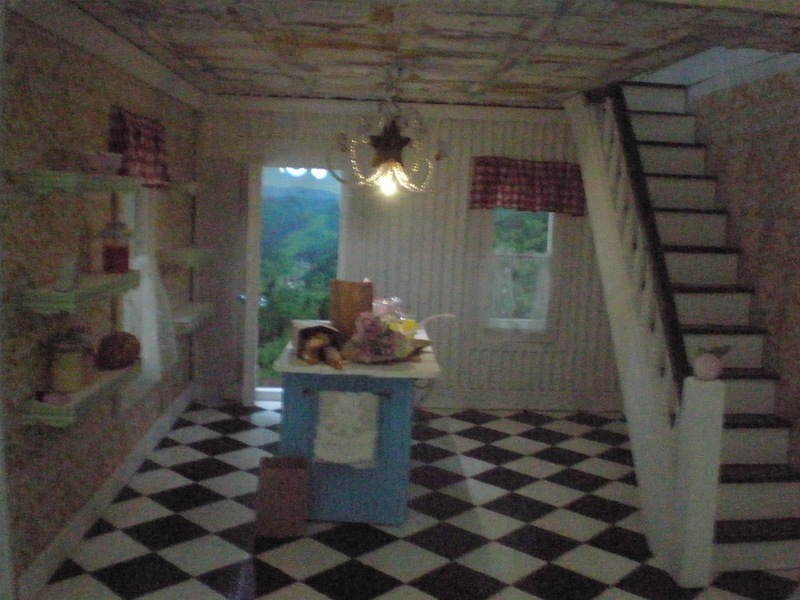 Wow Caroline, what an adorable house. I love every detail !!! 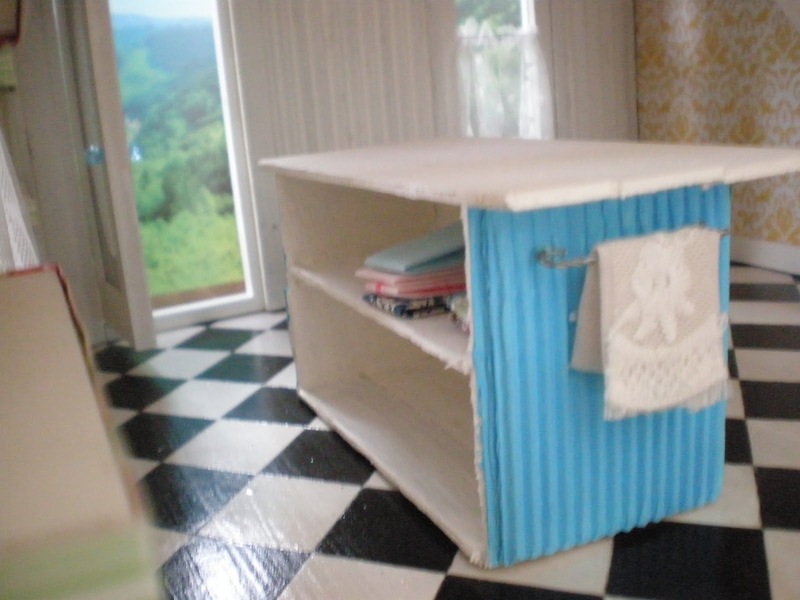 I love the things you've been making Caroline!! The little island looks fantastic and the chandeliers are gorgeous.I really love the pink one, it looks perfect with the handpainted roses on the wall. Me encanta el candelabro oxidado,la mecedora queda genial. A esa fantastica isla le vas a sacar mucho partido, poniendole precioso detalles. Estoy deseando ver los avances. Beautiful house. I love the island. The stairs is wonderful and your chandeliers are amazing. Hi Caroline! I love how you finished the little shelves on the wall. 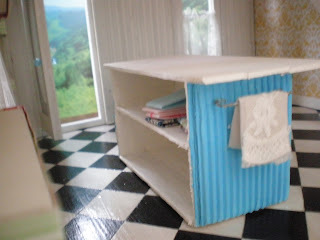 The turquoise of the island looks awesome against the black and white check floor which I am crazy about. I love those stairs. you don't often have them in your houses, do you? 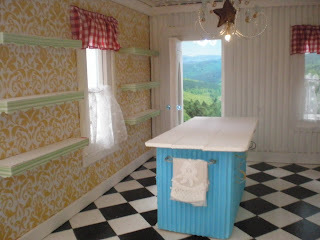 Upstairs, I find that the mixture of wallpaper you have used go so well together! That little cake on the table is so sweet and also the bouquet of roses. My goodness, Caroline, you are such a hard working woman! 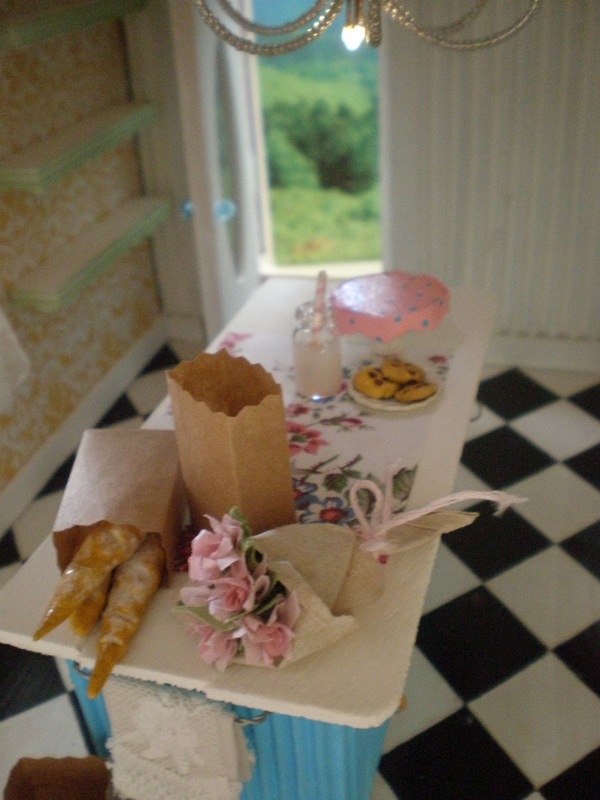 I don't think I'm mistaken when I say you are the miniaturist who produces the most in a short time span. You rock, girl! Pero que bonita! !Cuantos detalles que podrás añadír, me gusta!!! Es fantástica, como todas tus casas. Another beautiful project! I love the colours. I am amazed what afast worker you are. Fantastic house! I like the island and other things you've been making. The colors are harmonious. 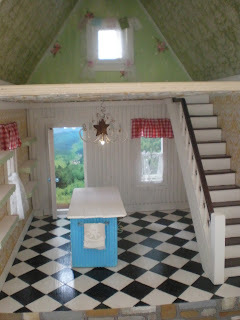 It's another lovely dollhouse! 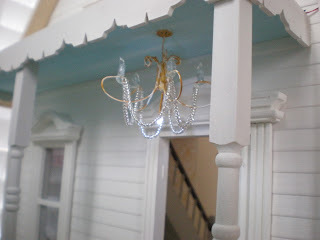 the chandeliers are amazing, i love them!!!! 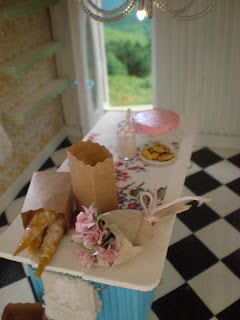 Love the counter with the wee towel hanging there and the bag of goodies and flowers, just so cute! Love the black and white checkered floor plan too. 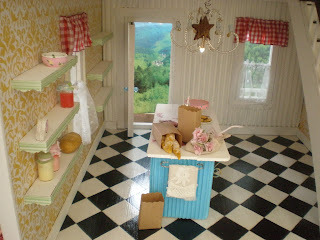 I'm absolutely crazy with the colors of this house, which is the colors that I've used in my country cottage dollhouse. I have become a big fan of your work and mentioned you quite a few times in my new post. I hope you don't mind and take this as the huge compliment it was meant to be!! I love the chair! Looks so comfy and chic. The house is turning out beautifully. The kitchen island is so detailed and adorable! So excited to see your finished work! I SOOOO need to figure out how to make those shelves you've lined the walls with. Great looking shop you have started! 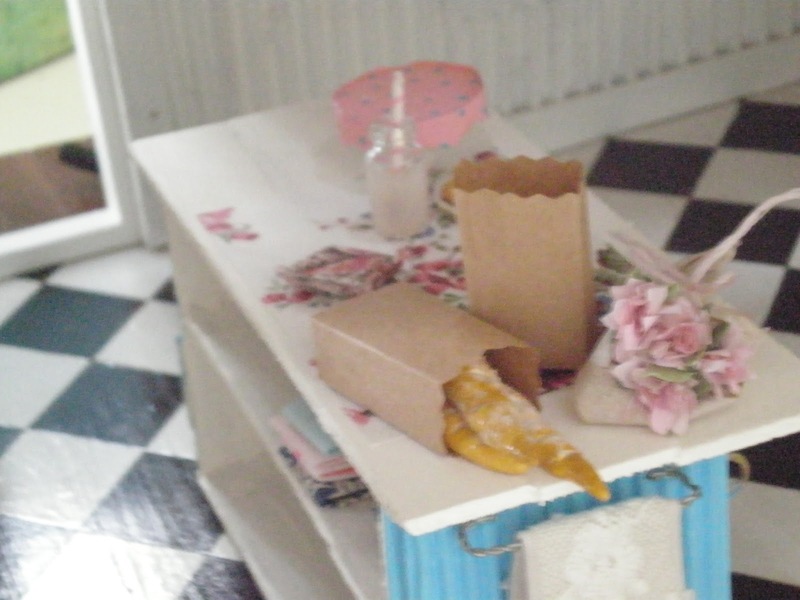 I also think the tiny paper bag is perfect for such a place! Maybe some day I will have a rocking chair like the one you put out front, but in 1:1 for my own front porch!